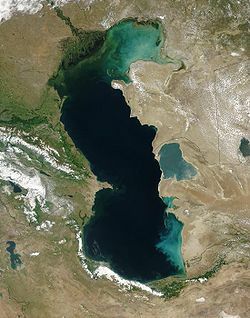 NASA Satellite image of the Caspian Sea. The Caspian Sea is landlocked sea between European Russia and Asia, and the world's largest inland body of water. It is bordered by Iran, Azerbaijan, Russia, Kazakhstan, and Turkmenistan with the central Asian steppes to the north and east. This page was last modified on 30 May 2010, at 22:08.